Reviews, ratings, and testimonials…from our patients’ point of view. I used to hurt most days and didn’t want to exercise. I had trouble bending, sitting, and standing for long periods of time. I can exercise 3 times a week with little pain and can drive without pain in my hips or back since going to Spine Correction Center of the Rockies. I came to Spine Correction Center for my scoliosis and moderate back pain. I struggled with lifting my children and getting out of bed. Now I am able to work out and need less time to recover. I get out of bed pain free and am able to lift my children. The office was very comfortable and gave a feeling of connectedness. I came to the Spine Correction Center to be treated for Scoliosis. I was experiencing pain and discomfort with most activities. Since I’ve begun care I generally have less pain and discomfort. My posture has improved as well as my involvement in physical activities. My quality of life has improved. The office, doctors and staff have been very professional and provided excellent explanations of processes and procedures. They provide excellent treatment. I suffer from scoliosis and have pain, stiffness, and tiredness. I was embarrassed by how I looked and had quite a bit of pain in general. Since my treatment I have much less discomfort and I don’t get tired as easily. The whole process is really amazing. I love that there are people who know that scoliosis can be helped. I’m very pleased! Spine Correction center is the best. My husband and I both went there for treatment and have finished our treatment and feel like new people. We don’t have the back pain and knee pain we use to have. The staff is so friendly and helpful. They go out of their way to achieve the goal you want to have. Thanks Dr. April and Dr. Mike you are an awesome team! I came to Spine Correction Center of the Rockies of pain in my back and hips. My hips hurt so bad that I could only walk a little ways before I’d have to sit down. My back bothered me so I couldn’t sleep. Since treatment began my hips feel better and I can walk quite a ways and it doesn’t bother me. The whole staff is caring, knowledgeable, and very concerned about my problems. I had low back pain for 20 years and severe pain in my leg. I was unable to stand for very long. The pain curtailed many activities and I felt no joy in life. Since treatment I have my positive attitude back and have been able to participate with my grandchildren and sing in the choir again. I was suffering from lower back pain, fatigue, and problems sitting. This affected my life and work. Since I began care I’ve seen a huge improvement. The pain is practically gone! The doctors and staff are awesome and have tons of dedication, compassion, and expertise. Dr. Farrell’s free dinner workshop is a great way to learn how to take care of yourself while enjoying a night out with your friends. I highly recommend it. I came to the Spine Correction Center of the Rockies for my scoliosis. I had severe back and neck pain, pain in my right leg, and headaches. I wasn’t able to sit very long and my back hurt all the time. I’m much stronger now. My back doesn’t hurt at all. I feel taller, more balanced, and happy with all the treatments. 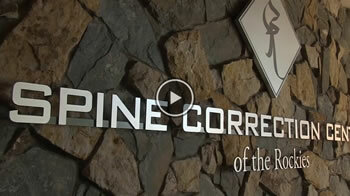 I could hardly walk without pain when I started treatment at Spine Correction Center of the Rockies. I didn’t want to be active at all. Since treatment I can move without pain. All of the staff is so great and friendly. I came to Spine Correction Center of the Rockies because I could barely walk or stand. I have seen a huge improvement and can perform most of my daily tasks better. I am also sleeping better. I experienced severe low back pain for several hours after waking up every morning. My low back pain vanished soon after treatments began. My life is much improved. I was brought to the Spine Correction Center because of a sore neck, sore lower back, lower back spasms, and pins and needles in my left arm. These conditions were negatively affecting my posture and I was unsteady on my feet with a poor range of motion. Since I’ve begun care, my neck and left arm are so much better! My range of motion has improved so much and I feel confident when I am walking. My posture has also improved. The doctors and staff are professional, friendly and show great concern for the patients. When I came to the Spine Correction Center I thought I was ready for a wheelchair. Since I began care I am 100% improved! The staff is very organized and professional. I had terrible back pain and wasn’t able to sit, stand, or walk without pain. I couldn’t hold my kids or play with them and I was unable to take care of my home the way I wanted to. My pain has now greatly decreased and I can play with my kids and take them for walks. I can also drive myself to the places I need to go now. “Because of my habit of always being in a hurry, I had fallen several times down short flights of stairs and off ladders, always onto my left hip! Not surprisingly, I began having chronic left hip and leg pain. The pain was always worse when I had to sit still for even short periods—but especially when I was driving on a long road trip. Upon standing, I would move slowly and painfully. Eventually, my sleep was interrupted by hip and leg pain. Twice over a period of several months, an orthopedist injected cortisone in the hip bursa and the injections lessened the pain temporarily. Several visits to two other chiropractors in other cities had offered no lasting relief. Initially, I received intensive therapy for two weeks with Dr. Farrell. Periodically, I have returned for maintenance therapy whenever I travel from NM to Denver to visit my daughter I feel like a new person (even though I am actually 68!). Everyone in the office is consistently friendly, caring, and efficient. Dr. Cardwell and Dr Farrell are obviously passionate about and truly expert in their professions. The receptionists are always cheerful and welcoming. The therapy assistants could not be any more kind, effective and encouraging. I had low back pain that made it hard to hold my grandkids. It was also difficult to ride in a car. Since beginning care I feel so much better. I can finally hold my grandbabies again! The staff is kind and understanding. “I could not walk more than three steps at one time or stand, sit, bend, or lift without very intense pain. I had not worked since December 2007. Surgery looked like the only option and I was dreading the thought. I had very limited activities, virtually no work, I was becoming buried financially, becoming depressed, a lot of anxiety, a feeling of hopelessness. The results have dramatically changed my pain level to at least 50% of before, now it is tolerable. I am walking farther, more often & closer to normal than I have in the past 18 months. My depression is lifting and hope has been restored. Looking forward to returning to full time work soon. I was rear ended and sought treatment at SCC due to my persistent headaches following the accident. It was difficult to find a comfortable position to sleep in and I could not escape the headaches and neck pain. My results gave me less intense headaches and a decrease in the frequency. I also have more movement in my neck and upper back. I came to SCC for my fairly severe scoliosis and continuous pain. I am an active athlete and felt my performance suffer as well as felt myself being more cautious in my competition. I now have significantly less pain and some days none at all. I also have greater flexibility and back strength. I came to the Spine Correction Center because I had hurt my back rock climbing. I couldn’t climb, sit or sleep without pain before treatment but am now able to do all of those without pain and curve has been restored to my spine. The doctors and staff are very friendly and helpful and seem interested and engaged in their work. The doctor’s and staff are amazing. They know my name and are happy to see me. They listen to what I’m feeling and my concerns and are very willing to help in any way. I have great confidence in everyone in this office. I came to the Spine Correction Center to be treated for Scoliosis. I had terrible headaches every day. Since I’ve started care my headaches are minimal and my back doesn’t hurt as often as it used to. All the staff is very friendly and nice and they all care for every patient. I was in unbearable pain constantly and didn’t want to do anything or go anywhere. Since treatment I have been feeling so much better and have cut down almost completely on my pain medications. “I had carpal tunnel, neuropathy in my feet from type 2 diabetes, neck problems and a bad left knee. I could not play the piano and organ like I used to because of the hand, feet and knee pain. Playing the organ pedals was difficult. I was experiencing burning and pin and needles in my left arm and hand. It affected my sleep and eating. I was uncomfortable and worried often. I feel better, am sleeping better, and eating better since my treatments. I am also taking less pain medication and am very active. The doctors and staff really care about getting you better. I had difficulty in breathing and ongoing pain. After several treatments my curve has gone down from 72 degrees to 60 degrees. My pain is almost gone. My breathing difficulties are gone completely and my posture has improved tremendously. It’s absolutely amazing, a scientific miracle, and I recommend it to everyone I know. My scoliosis was causing me pain when walking or sitting. I was not able to walk very far and it was difficult to do jobs around the house. Now, I can more easily do lengthy tasks and I can sit longer. Everyone is so positive and creates a very comfortable helpful atmosphere.